Took the kids to the movies last night. 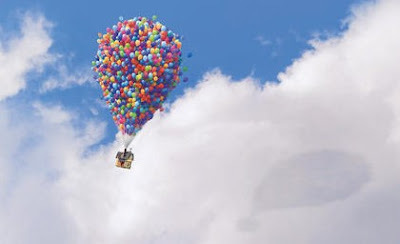 The 21-year old and the 19-year old both wanted to see Up. Luckily I did too. I cried through the first part. But I won't spoil it for others. I was terrified through the second part. Turns out that people who are scared of airplanes are really scared of flying houses. I laughed through the third part. Talking dogs, rainbow birds, and 10-year old cartoon boys will do that. I was terrified again through the fourth part. Dirigibles are just as bad as airplanes and flying houses. And cried again in the end. By the time we left the movie theater I was a sweaty mess. We went for dinner. We had Lebanese food. I am wildly allergic to chickpeas. Had to make my way through the menu in a here be dragons mode. Managed not to blow up like a puffer fish. Phew. Living on the edge, I'll tell you. I cried too. Loved those dogs! Allergic to chickpeas! What a sad affliction!